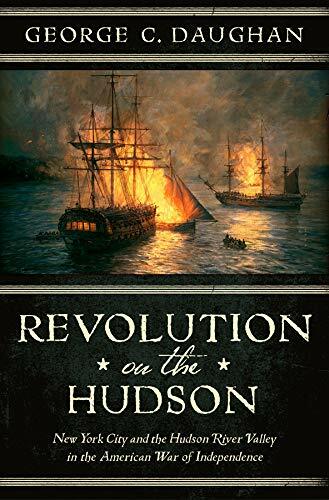 Author George C. Daughn argues that the key geographical position or linchpin to winning the Revolutionary War was the Hudson River Valley extending from New York City to the corridor from Lake George, through Lake Champlain, and on up into the Canadian province of Quebec. For the British, the idea was to gain and maintain control of this lengthy stretch by marching armies south from Canada and north from New York City, splitting the colonies of the northeast from those of the middle Atlantic. Theoretically, the rebellion would then wither on the vine as a result of the isolation and inability of the colonies in each region to mutually support the other and the anticipated thousands of Loyalists who would flock to the King’s banner. For the colonials, naturally, if they could deny this to the British by continual threats to their base in New York City and blocking the river, it would make their overall efforts that much more difficult and frustrating through a long and drawn out war, forcing them to recognize the independence of the new United States of America. Given the sparse population of America at the time, the limited technology, infrastructure, and resources, this was largely a pipe dream. although in the event the colonials did manage to interdict this corridor through much of the war, from north of New York City-most famously at West Point-to the battlefield of the glorious victory at Saratoga, south of Lake George. Through a succession of sometimes inept, timid, and other times overly cautious military and naval commanders, worried about their reputations and possibly being blamed for the failure of King George III’s Hudson River strategy, in combination with what they considered a lack of sufficient resources from London, the British failed to accomplish their primary objective. Although the thesis of the book is as described above, the subtitle is a bit misleading. It does cover many of the events in and around the Hudson River Valley but it should be noted, somewhat critically, that this is also an overall account of the Revolutionary War itself, from the Middle Atlantic States to the late war campaign in the south as well as many of the naval actions in American waters as well as the Caribbean. On the other hand, very creditably, it also includes and develops many of the political, military, and diplomatic behind-the-scenes events that influenced the course of the war, particularly on the British side. Author Daughn especially highlights the haughty, arrogant and dismissive attitudes of the King, his government ministers and others of the “noble” propertied variety toward their colonial charges, their perceived grievances, and goal of independence. Of course, for the Continentals, General George Washington’s constant worries over money to pay his army, the requisite manpower to oppose British regulars and Hessian mercenaries, sufficient supplies to keep body and soul together and uncertainty as to British intentions kept him in a largely constant state of anguish in terms of his relations with the Continental Congress, state governments and even his own subordinates at times when it came to strategy. All of this is combined with the mutually strategic belief that the Hudson River Valley and Lakes corridor was the main seat of war, where it would be won or lost, notwithstanding the important battles in Pennsylvania, New Jersey, Georgia, the Carolinas and, ultimately, Virginia, where Cornwallis surrendered and the British called it quits. The excellent maps include only the Hudson River Valley, the Lake George and Champlain section and then north to Quebec. They give the reader an idea of just how extensive that distance is and how difficult it would have been for the British to control it, especially considering its wilderness aspect and the prospect of trying to hold, garrison and provision it during winter. The short (four page) “photographic” section consists of illustrations of some of the leading figures in the book, Washington’s triumphant entry into New York City, and one of the famous John Andre spy event. All come from the Library of Congress. The endnotes are “non-traditional” in that they only identify the source of quoted documents, letters, and other material in the text. The bibliography does demonstrate research in a wide variety of primary and secondary sources. The various British difficulties and problems in accomplishing their objective meant that it was more a matter of the Continentals holding out long enough and just simply not losing rather than actually needing to defeat their opponents. As a result, the British government had only itself to blame for the loss of its colonies—as the author has so ably demonstrated.